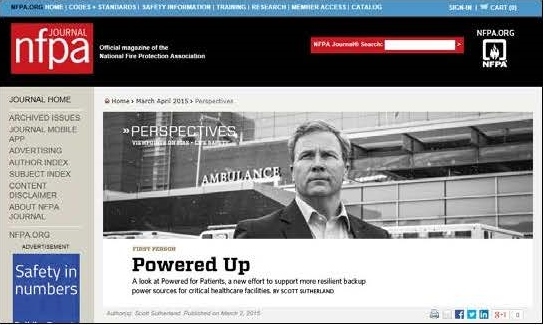 We wanted to share a profile of Powered for Patients that was published last week this month by NFPA Journal, the official publication of the National Fire Protection Association (NFPA). You may recall that Robert Solomon, PE, a senior official with NFPA, took part in the initial 2014 Powered for Patients Stakeholder Meeting. Robert was instrumental in facilitating the NFPA profile for which we are grateful. Powered for Patients was the only healthcare-focused organization that took part in a high-level Roundtable in Washington, D.C. with federal officials, cyber security experts and utility industry representatives to address the implications of a long-term power outage on critical healthcare facilities. The Experts’ Roundtable on Preparing for a Potential Prolonged and Widespread Outage of the Electric Power Grid was an off-the-record discussion among state, federal, and private sector interests to help frame the topic of widespread or prolonged power outages for elected leaders; gather input on how elected officials are currently addressing this topic and could improve their preparation and planning; and discuss how to share best or promising practices. A select group of key stakeholders gathered in Washington, D.C. on August 19, 2014 for a day-long meeting to discuss how to better ensure backup power and utility power for critical healthcare facilities impacted by disaster. The official report of that meeting was released in late October 2014. Those participating in the meeting included federal, state and local public health officials and emergency managers, and representatives from the power generation industry, the utility sector and the healthcare industry. The Powered for Patients Initial Stakeholder Meeting was co-sponsored by the Association of State and Territorial Health Officials (ASTHO), the National Association of County and City Health Officials (NACCHO), and the National Emergency Management Association (NEMA). All three organizations are working closely to advance Powered for Patients in collaboration with the Office of the Assistant Secretary for Preparedness and Response (ASPR) at the U.S. Department of Health and Human Services. The Stakeholder Meeting addressed critical lessons from Hurricane Sandy and other disasters that continue to shape policy discussions and programming at ASTHO, NACCHO, NEMA and other leading public health and emergency management organizations. Among the key lessons learned was the need to protect backup power for critical healthcare facilities to avoid emergency evacuations. The need to enhance power restoration prioritization for critical healthcare facilities also became evident. Lessons learned about backup power from Hurricane Sandy and previous disasters, and progress made (or not) in heeding lessons learned. Overview of the current approach to power restoration decision-making and opportunities to accelerate restoration for critical healthcare facilities. The state of the generator fleet and opportunities to enhance reliability and performance of backup power systems for critical healthcare facilities. Opportunities to enhance situational awareness of generator status for disaster-impacted healthcare facilities through the use of remotely monitored generator data or other means. The technical and operational challenges faced by the generator industry, healthcare facilities and utilities during disasters and opportunities for government to assist in addressing these challenges. Participation in the initial stakeholder meeting was limited to a small working group to enable a productive initial discussion among key stakeholders. However, broad involvement from stakeholder communities is encouraged. For a full copy of the Stakeholder Meeting Report, or for more information about working with Powered for Patients, contact Project Director Eric Cote, at cote@disastersafetystrategies.com.